WEST LAFAYETTE, Ind. — Indiana Gov. Mitch Daniels has declared May 18-24 Emerald Ash Borer Awareness Week, part of a multi-state effort to reinforce the dangers of firewood movement by unsuspecting citizens. “Emerald Ash Borer (EAB) Awareness Week is aimed at all citizens, but we’ve chosen to focus our efforts on state parks and properties because firewood movement is by far our biggest problem in slowing the spread of EAB here in Indiana,” said Jodie Ellis, Purdue University entomologist. 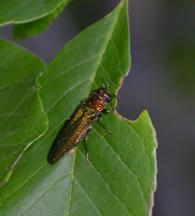 Adult emerald ash borers feed lightly on ash leaves. Their larvae, however, feed on ash vascular tissue and are almost always fatal to the trees they infest. Because moving firewood from any quarantined area is against both state and federal laws, state parks and properties encourage campers to buy firewood locally and burn it completely before leaving campsites. “Indiana state parks and properties are partnering with Purdue, the Indiana Department of Natural Resources (IDNR) and the United States Department of Agriculture’s Animal Plant Health Inspection Service to continue to spread the firewood and quarantine message to all citizens,” Ellis said. Seventeen counties in Indiana are quarantined by IDNR because of emerald ash borer finds. Ash firewood and other materials that could transport emerald ash borer cannot be moved from these counties without a compliance agreement from the agency. In addition, there is a federal quarantine in effect that prohibits the movement of regulated ash products from Indiana, Illinois and Ohio, as well as parts of Michigan, Pennsylvania, West Virginia and Maryland. Further quarantine information and maps are available online at http://www.entm.purdue.edu/eab. “State park and property employees will be participating in a training program so they can serve as reliable sources of up-to-date EAB information for campers and park and property visitors,” Ellis said. The week coincides with Memorial Day weekend, which is the unofficial start of the Midwest camping season. “We’re expecting high camper turnout for Memorial Day, so state park and property officials will greet visitors with banners, informative handouts and fun activities relating to our message about emerald ash borer,” Ellis said. Some of those activities include emerald ash borer playing card giveaways, children’s games and fun books to reach people of all ages. Experts believe emerald ash borer arrived in the United States in the early 1990s via wooden shipping crates from Asia. Since its discovery in Detroit in 2002, emerald ash borer has killed more than 25 million ash trees in the United States.